Below are several news reports. Bolding was done by this blog. 2000年の前々回会議の合意からさらに核兵器廃絶に向けて進もうと確認しており、一定に評価できる内容だ。昨年の準備委員会段階から加盟国が「会議を決裂させてはならない」と言っており、最終段階で各国が歩み寄ったのだろう。ただ最初の素案にあった核兵器廃絶の行程表の部分は大きく後退し、廃絶への明確な道程が示されなかったのは不満だ。加盟国の具体的な行動をさらに求めたい。"This conference is a step forward from the 2000 review conference. The participating countries cooperated in order not to make the conferenced fall apart (like it did in 2005). I am dissatisfied with the fact that the concrete schedule for nuclear disarmament, which was in the original draft, was removed, and no clear path for abolition was presented. I want all the participating countries to take more concrete actions. " Jiji reports comments by Hiroshima Mayor Akiba and Nagasaki Mayor Taue. Akiba: It is meaningful that all participating nations, including NWS, agreed upon taking actions toward nuclear disarmament and abolition. Taue: NPT would have collapsed if the nations could not reach an agreement, so I recognize the achievement of the final document. However, the content of the document has taken steps backward. As a city that experienced atomic-bombing, I am dissatisfied." Although a compromise was made, which was of course a lot better than no compromise, there was general dissatisfaction within non-nuclear states that nuclear states refused to set a exact timing for total elimination or to hold a conference for disarmament in 2014 to set a schedule for abolition. Arab states were satisfied and Obama dissatisfied about Israel being named, and vice versa about Iran not being named. All participants were together for their position on DPRK, Pakistan and India. 2010 Middle East conference seems to be the most concrete agreement in the final document this time, but US is already expressing dissent. A UN conference reviewing the Nuclear Non-Proliferation Treaty has adopted a final document that confirms signatory nations' efforts to achieve a nuclear-weapons-free world. The final document was unanimously approved on Friday, the last day of the month-long conference in New York. The document says nuclear-weapons states under the treaty are committed to work for the total abolition of their arms. It asks these countries to start negotiating on ways to achieve that goal and report back on their progress to the conference's preparatory committee by 2014. Japan's permanent representative to the Conference on Disarmament in Geneva, Akio Suda, told reporters that he is not satisfied with all aspects of the agreement but it includes forward-looking steps, such as reporting by nuclear powers on their efforts during the next 4 years. France's disarmament ambassador Eric Danon stressed the importance of not backtracking on nuclear disarmament. He explained that France will proceed with the reduction of its nuclear arsenal at its discretion, saying it is not desirable to set a specific international timetable. UNITED NATIONS, May 28 (Xinhua) -- The 2010 Review Conference on Nuclear Non-proliferation Treaty (NPT) reached consensus and approved a final document toward nuclear disarmament here Friday afternoon. The final document, approved by 189 member nations of the treaty after month-long meeting since May 3, have agreed on measures toward disarmament and the establishment of a nuclear weapon-free zone in the Middle East. This was the first agreement in a decade on the 40-year-old NPT, which has set the global agenda for preventing countries from developing nuclear weapons. The 28-page final document said the five recognized nuclear- weapon states - Britain, China, France, Russia and the United States - commit to "accelerate concrete progress on the steps leading to nuclear disarmament," take steps to "further diminish the role and significance of nuclear weapons" and report back on progress by 2014. "In implementing the unequivocal undertaking by the nuclear- weapon states to accomplish the total elimination of their nuclear arsenals, the nuclear-weapon states commit to undertake further efforts to reduce and ultimately eliminate all types of nuclear weapons, deployed and non-deployed" through various agreements, the document said. The final document also called to the UN Secretary-General and co-sponsors of the 1995 Middle East Resolution to convene a conference in 2012, "to be attended by all states of the Middle East, on the establishment of a Middle East zone free of nuclear weapons and all other weapons of mass destruction." It called on Israel to sign the NPT and to place "all its nuclear facilities under comprehensive safeguards of the International Atomic Energy Agency (IAEA)." The document also urged the Democratic People's Republic of Korea to return "at an early date" to the six-party talks and to carry out obligations under the talks, which include China, the United States, Russia, the Republic of Korea and Japan as well. Those obligations include the "complete and verifiable abandonment of all nuclear weapons and existing nuclear programs." The NPT conference chairman, Philippine Ambassador Libran Cabactulan, said at the closing ceremony that the revised draft declaration was "carefully balanced" to reflect demands by all parties. He said adoption of the declaration would allow "all the seeds of hope planted throughout the conference would bear fruit." Egyptian Ambassador to the UN Maged Abdelaziz said on behalf of the 118-nation Non-Aligned Movement (NAM) that the NAM considered the document "an important step forward towards the realization of the goals and objectives" of the treaty. On the issue of the Middle East nuclear-weapon free zone, he said the NAM countries intend to engage constructively with all concerned parties to implement the practical steps adopted in the final document. "The road ahead is not easy but it's the only way forward," said Abdelaziz. The review conference is convened every five years to review and advance the objectives of the NPT, under which nations without nuclear weapons committed not to acquire them; those with them committed to move toward their elimination; and all endorsed everyone's right to develop peaceful nuclear energy. The last conference in 2005 was largely considered a failure as members were unable to agree on a number of issues nor produce a final document. After the adoption of the final document, UN Secretary-General Ban Ki-moon issued a statement, welcoming the "successful outcome" of the conference. "A strong spirit of compromise and cooperation has delivered a significant agreement to build a safer and more secure world," said Ban. The statement said Ban "particularly welcomed" the agreement on a process leading to full implementation of the 1995 resolution on the establishment of a Middle East nuclear weapon-free zone. He encouraged state parties to translate all of their commitments into concrete action so to realize the common goal of a world without nuclear weapons. The US has agreed to a deal at the United Nations that would put pressure on Israel to join the nuclear Non-proliferation Treaty (NPT), according to Western diplomats. Delegates in New York are concluding a month-long round of talks aimed at updating the NPT. Their final draft reportedly urges Israel to join the treaty and subject its nuclear facilities to oversight by the International Atomic Energy Agency (IAEA). The document also calls for the United Nations secretary-general to call a meeting of Middle East states in 2012, aimed at creating a region free of nuclear, biological and chemical weapons. The United Nations is scheduled to vote on the draft later on Friday; Syrian and Iranian diplomats have both hinted they might not support it. "We have a deal that everyone can live with," an unnamed Western diplomat told the Reuters news agency. "Now the question, is will Iran do the right thing? Will they go against something the entire Arab League and everyone else here is ready to support?" Opposition from either country would be enough to stall the agreement, because all signatories to the treaty are required to approve the changes. Iranian negotiators want a provision requiring the five official nuclear powers - the US, UK, France, Russia and China - to establish a timetable to dismantle their nuclear arsenals. The NPT is intended to stop the spread of nuclear weapons. It allowed those existing nuclear powers to keep their weapons. "The five nuclear-weapon states cannot easily and totally ignore this legitimate request. If so, then the conference will not be successful," Ali Asghar Soltanieh, Iran's ambassador to the IAEA, said. Israel is one of only three states which never signed the NPT, the other two being India and Pakistan. It is believed to have a nuclear arsenal, though it refuses to confirm or deny its existence. The 2012 meeting - on a "weapons of mass destruction"-free Middle East - could effectively force Israel to declare and dismantle its nuclear weapons program. Israel has said it backs such an agreement in principle, but only after signing peace treaties with other countries in the region. The US had initially sought to block the provision; Washington has long shielded Israel from pressure to disclose the details of its nuclear program. But American diplomats eventually agreed to the provision to salvage the conference. "The Arab group basically drew a line in the sand and said, this is as far as we can go in compromising. This language must stay, or we will not back the final document," Al Jazeera's Kristen Saloomey said, reporting from New York. "[And] the United States was very interested in moving this agenda of non-proliferation forward." Ellen Tauscher, the US under-secretary of state for arms control, said "the United States deeply regrets" that the draft pressures Israel to join the NPT. If negotiators agree on a bargain, it would be the first successful NPT review meeting since 2000. The 189 states parties to the Nuclear Non-Proliferation Treaty overcame differences and agreed to a final outcome document Friday, capping off a month-long review conference. The document lays out steps toward the long-term goal of nuclear disarmament, but does not set any deadlines or benchmarks for that goal. The 28-page final document lays out action plans for all three of the Nuclear Non-Proliferation Treaty's (NPT) three pillars - non-proliferation, disarmament and peaceful uses of nuclear energy. It calls on the five original nuclear weapons states - the U.S., France, Britain, China and Russia - to speed up "concrete progress" on their disarmament and move towards an overall reduction of their nuclear arsenals. They are also urged to lessen the role and importance of nuclear weapons in their military and security policies, and further enhance transparency and increase mutual confidence. The document also calls for a conference to be held in 2012 on the establishment of a Middle East zone free of nuclear weapons - an idea endorsed at the 1995 review conference, but never implemented. Egyptian Ambassador Maged Abdelaziz, who spoke on behalf of the 118 members of the Non-Aligned Movement, welcomed that move. "We have moved forward and achieved progress in adopting an action plan to push towards the implementation of this resolution, to establish a zone free from nuclear weapons as well as other weapons of mass destruction in the Middle East," he said. Delegates negotiated the document until the final moments Friday. There were concerns that Iran could be a spoiler to any consensus. The Islamic Republic is the only NPT signatory to be found by the International Atomic Energy Agency to be in non-compliance with its nuclear safeguard obligations. It is currently facing a possible fourth round of U.N. sanctions for its suspect nuclear program. But ultimately, Iran did not stand in the way of the document's adoption, although it did list several things it felt were flawed about it. North Korea, which announced its withdrawal from the treaty in 2003, was singled out in the final document and urged to return to the Treaty and adhere to its IAEA safeguards agreement. Pyongyang came in for a rebuke from the U.S. delegate, Under Secretary of State for Arms Control, Ellen Tauscher. "North Korea should understand that it will never achieve security or acceptance by the international community without the complete and verified abandonment of its nuclear weapons programs. North Korea's behavior, particularly its failure to implement its commitments under the Six Party Talks, to include its return to the NPT and IAEA safeguards at an early date, calls into question the utility of negotiations with North Korea," she said. The only three nuclear states not to be signatories to the NPT - India, Pakistan and Israel - were urged in the final document to join the treaty and place their nuclear facilities under IAEA safeguards. Israel, has never publicly acknowledged it has nuclear weapons, but is widely believed to - a point of contention among its Middle Eastern neighbors. Most states said that while the action plans did not meet all their expectations, they were generally satisfied with the final outcome. At the 2005 review conference - these meetings are held every five years - the conference ended in failure when parties could not agree on a final document. U.N. Secretary-General Ban Ki-moon welcomed the outcome in a statement, saying the strong spirit of compromise and cooperation had delivered a significant agreement to build a safer and more secure world. UNITED NATIONS -- After 15 years, Arab nations finally won agreement from the United States and the other nuclear powers to take the first step toward banning nuclear weapons from the Middle East. Now, the next move is Israel's. Although the U.S. joined the 188 other member nations of the Nuclear Nonproliferation Treaty on Friday in giving a green light to a conference in 2012 "on the establishment of a Middle East zone free of nuclear weapons and all other weapons of mass destruction," senior U.S. officials appeared to backtrack afterward, setting several conditions for the talks to go ahead. Taking the toughest line, U.S. National Security Adviser Gen. James Jones said in a statement Friday night that the United States has "serious reservations" about the 2012 conference and believes Mideast peace and full compliance by all countries in the region to their arms control and nonproliferation obligations "are essential precursors." The compliance demand appeared to be aimed at Iran, which the U.S. believes is pursuing a nuclear weapons program despite Tehran's claims its only goal is nuclear power. Jones also strongly defended longtime U.S. ally Israel, which was singled out for not being a member of the NPT. He said the United States "deplores" the naming of Israel which puts prospects for the 2012 conference "in doubt." As a co-sponsor of the conference, Jones said the United States will ensure that it will only takes place "if and when all countries feel confident that they can attend." The Arab proposal for a WMD-free zone - to pressure Israel to give up its undeclared arsenal of perhaps 80 nuclear warheads - was endorsed by the 1995 NPT conference but never acted on. At this month's NPT review, a conference to begin talks on a nuclear-free Mideast was considered by many delegates as "the make-or-break issue," and agreement on the 2012 meeting was widely welcomed after the 28-page final declaration was approved by consensus. But the U.S. reaction raised questions and doubts about whether Israel, Iran and other countries in the Mideast will even hold a meeting in two years. Several delegates suggested that earlier comments by U.S. Undersecretary of State Ellen Tauscher and President Barack Obama's coordinator for weapons of mass destruction, Gary Samore, warning about the difficulties of holding a conference and persuading Israel to attend may have been sparked by the upcoming visit of Israel's Prime Minister Benjamin Netanyahu to the White House on Tuesday. Egypt's U.N. Ambassador Maged Abdelaziz, speaking for the 118-nation Nonaligned Movement of mainly developing countries, said that during the negotiations there was "a little bit of disagreement" on mentioning Israel. But he said NAM members thought that since the document issued at the end of the 2000 NPT review conference mentioned the need for Israel to join the treaty and subject its nuclear capabilities to International Atomic Energy Agency safeguards there was "no going back on that commitment" and Israel had to be mentioned in the 2010 document as well. A Mideast conference on nuclear issues would put Israel and Iran, which has called for the destruction of the Jewish state, at the same table. But Abdelaziz told reporters the two countries already sat down at the same table at a meeting in Cairo last December. "So there is nothing that could prevent any two adversaries to sit at the table and negotiate, and we hope that this is the spirit that everybody is going to be doing," he said. Iran had loomed as a potential spoiler that would block consensus at this conference, and Iran and Syria dissented loudly on various points in the final hours, but no objections were raised in the concluding session. Facing possible new U.N. sanctions because of its refusal to suspend uranium enrichment and enter negotiations on its nuclear program, the Iranians had sought to turn the spotlight instead on the big nuclear powers, demanding the final document call for speedier disarmament moves. Iran's chief delegate Ali Asghar Soltanieh lamented that the deadline of 2025 sought by NAM for complete disarmament was not included in the final document. Nonetheless, Soltanieh called "the limited measures" in the agreement "a step forward." While Israel was named, the final document did not single Iran out as a member nation that has been found to be in noncompliance with U.N. nuclear safeguards agreements. Jones, the U.S. National Security Adviser, said the failure of the resolution to mention Iran, "which poses the greatest threat of nuclear proliferation in the region and to the integrity of the NPT, is also deplorable." Earlier, Tauscher had also criticized Iran for doing "nothing to enhance the international community's confidence in it by its performance in this review conference." Iran's Soltanieh said the Americans should "think twice" before making such statements. "This was not the right reaction to a positive response, positive measure by our delegation joining the consensus," he said. According to the final document, U.N. Secretary-General Ban Ki-moon and the co-sponsors of the 1995 Mideast resolution - the U.S., Russia and Britain - will now appoint a "facilitator" to conduct consultations in preparation for the 2012 conference. Jones said the United States "will insist that the conference operate only by consensus by the regional countries" and that any further discussions or actions also be decided on this basis. Britain's chief negotiator, Ambassador John Duncan, said Friday's decision is the start of a process and dialogue on a WMD-free zone in the Mideast. "So it would be surprising if Israel was able to agree today to come to the proposed conference before that dialogue has taken place," he said. "But the clear goal of this decision is to have all the countries of the region involved." Under the 1970 nonproliferation treaty, nations without nuclear weapons committed not to acquire them; those with them committed to move toward their elimination; and all endorsed everyone's right to develop peaceful nuclear energy. The last NPT conference, in 2005, failed to adopt a consensus declaration. In sharp contrast, a final declaration was not only adopted this year but for the first time it laid out complex action plans for all three of the treaty's "pillars" - nonproliferation, disarmament and peaceful nuclear energy. Under its action plan, the five recognized nuclear-weapon states - the United States, Russia, Britain, France and China - commit to speed up arms reductions, take other steps to diminish the importance of atomic weapons, and report back on progress by 2014. The plan also has 24 steps to promote nonproliferation including making the treaty universal to include Israel, Pakistan India and North Korea, to encourage tighter inspections and controls on nuclear trade to prevent development of secret weapons programs. Iran has faced international pressure over its nuclear programme Signatories of the Nuclear Non-Proliferation Treaty (NPT) have agreed to work towards a nuclear-weapons-free zone in the Middle East. 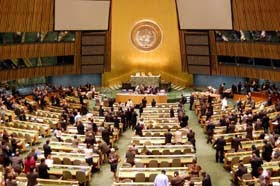 The members, meeting at the UN in New York, called for a conference in 2012 attended by Middle Eastern states - including Iran - to establish the zone. The unanimously agreed document also said that Israel should sign the NPT. US President Barack Obama backed the deal but said he was "strongly opposed" to Israel being singled out. The US says the reference could jeopardise efforts to persuade the Israelis to attend the 2012 talks. The decision was crucial to the success of a month-long conference on strengthening the NPT, says the BBC's United Nations correspondent Barbara Plett in New York. The treaty is seen as the cornerstone of global disarmament efforts, she adds. The 28-page final declaration was agreed following intense talks on the last day of a month-long conference. The document calls for the United Nations secretary general to organise a meeting of Middle East states in 2012 to agree to the creation of a "zone free of nuclear weapons and all other weapons of mass destruction". "All eyes the world over are watching us," said conference president Libran Cabactulan, of the Philippines, as the final text was approved. Egypt's Maged Abedelaziz, speaking for the Non-Aligned Movement of 118 developing nations, welcomed the decision, saying it was "an important step forward towards the realisation of the goals and objectives of the treaty". Diplomats discussing the proposals had continued talks late into the night on Thursday before resuming on Friday. One of the sticking points involved Israel, a non-member of the NPT, which is widely believed to have nuclear weapons although it has never admitted to possessing them. Arab states and Israel's allies had to work hard to find agreement over wording for the proposed nuclear-weapons-free zone. Correspondents say Arab nations want to put pressure on Israel to relinquish its undeclared nuclear arsenal. Iran also made a late demand that the five recognised nuclear-armed nations agree to a timetable for negotiating a treaty to abolish their arsenals. In the final document adopted, no specific timetable is set out but the five states commit to "accelerate concrete progress" towards reducing their nuclear arsenals and to report back on that in 2014. Iran has faced repeated questions over its own nuclear programme, which the West believes is aimed at making weapons. Tehran insists it is solely designed to meet its energy needs. Iran, a member of the NPT, says it will stick to its obligations under the treaty. The NPT has encountered difficulty in coming up with the best method for monitoring suspect nuclear programmes in Iran and North Korea. India, Pakistan, North Korea and Israel - which are known or suspected to have nuclear weapons - are not signatories to the treaty. They are not covered by any NPT agreement. The NPT conference meets every five years. The last review conference, in 2005, failed to adopt a consensus declaration. The 189 nations participating in the 2010 Review Conference on Nuclear Non-proliferation Treaty (NPT) have approved a final document towards nuclear disarmament, including the establishment of a nuclear weapon-free zone in the Middle East. The 28-page final document was approved on Friday, the last day of the conference, which had lasted for almost a month since May 3. The five nuclear powers - Britain, China, France, Russia and the United States - committed to speed up arms reductions, take other steps to diminish the role of nuclear weapons, and report back on progress by 2014. "In implementing the unequivocal undertaking by the nuclear- weapon states to accomplish the total elimination of their nuclear arsenals, the nuclear-weapon states commit to undertake further efforts to reduce and ultimately eliminate all types of nuclear weapons, deployed and non-deployed," the document said. The declaration states that a conference "on the establishment of a Middle East zone free of nuclear weapons and all other weapons of mass destruction" should be conveyed in 2012. The document urges Israel, which has not signed the NPT and is believed to possess nuclear weapons, to sign the treaty and place "all its nuclear facilities under comprehensive safeguards of the International Atomic Energy Agency (IAEA)." The 189 nations called on North Korea, which has been under international sanctions since its first long-range ballistic missile test in 2006, to return "at an early date" to the six-party talks. The talks, involving Russia, Japan, China, the United States, North and South Korea, stalled last April when Pyongyang pulled out of the negotiations in protest against the United Nations' condemnation of its missile tests. North Korea should abandon "all nuclear weapons and existing nuclear programs," the document said. "A strong spirit of compromise and cooperation has delivered a significant agreement to build a safer and more secure world," UN Secretary-General Ban Ki-moon said in a statement issued after the document was adopted. The review conference on nuclear non-proliferation is convened every five years. Participants in the 2005 conference failed to approve a final document due to a number of disagreements on major issues. United Nations (CNN) -- The final document from the just-completed U.N. review conference on the Nuclear Non-Proliferation Treaty "not only fails to advance regional security but actually sets it back," the Israeli government said in a statement released Saturday. The month-long conference, which ended Friday, called for a 2012 conference of all Middle Eastern states to move forward on a 1995 proposal for a nuclear-free Mideast. The document also calls on Israel to sign the treaty and place "all its nuclear facilities under comprehensive IAEA (International Atomic Energy Agency) safeguards." Israel is not a member of the NPT and has neither confirmed nor denied that it has a nuclear weapons stockpile. The Israeli government statement calls the conference's document "deeply flawed and hypocritical" and "ignores the realities of the Middle East and the real threats facing the region and the entire world." The statement also complains that Israel is singled out in the document and Iran, which is a signatory to the NPT, is not mentioned. "The real problem with Weapons Of Mass Destruction in the Middle East does not relate to Israel but to those countries that have signed the Nuclear Non Proliferation Treaty (NPT) and brazenly violated it -- Iraq under Sadaam, Libya, Syria and Iran," the statement said. "That is why the resolution adopted by the NPT Review Conference not only fails to advance regional security but actually sets it back." The United States signed onto the final document Friday, but National Security Adviser Gen. James Jones later laid out "serious reservations." Jones said the United States supports the idea of a nuclear-free Mideast but believes it must wait for "a comprehensive and durable peace in the region and full compliance by all regional states with their arms control and nonproliferation obligations." Jones said the United States and the United Kingdom had agreed to co-sponsor the 2012 conference to ensure that it takes into consideration the issues of all countries in the region and that the consent of all countries in the region is achieved for any action. "The United States will not permit a conference or actions that could jeopardize Israel's national security. We will not accept any approach that singles out Israel or sets unrealistic expectations," said Jones, adding that the United States "deplores the decision to single out Israel" and "the failure of the resolution to mention Iran." In its statement, Israel noted "the important clarifications that have been made by the United States regarding its policy," but said "the distorted nature of the resolution" would prevent it from participating. "As a non-signatory state of the NPT, Israel is not obligated by the decisions of this Conference, which has no authority over Israel," the statement said. The statement added that Prime Minister Benjamin Netanyahu would discuss the issue with President Barack Obama during his visit to Washington next week.